'Don't go without it! An absolute MUST for anyone visiting or wishing to learn more about the Salient - WOW!' Michael Booker review. AND when you order this book you can choose any one of the five battlefield maps absolutely free in addition to the one wrapped with the book. This is the most complete guide-book to the Ypres & Passchendaele battlefields .Published September 2017. Over 340 pages, some 300 pictures, GPS locations throughout. 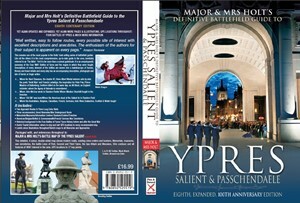 The authors are the only ones to have been officially recognised by the city of Ypres for the quality and excellence of this and earlier books.